The Nuclear Regulatory Commission has released a report detailing how a flawed system of steam generators led to the shutdown of the San Onofre nuclear power plant, which has now lasted more than a year. Mistsubishi Heavy Industries, which replaced the steam generators for Unit 2 and Unit 3 at San Onofre, constructed the report on what went wrong with their replacement generators. San Onofre has not generated any electricity since January 31, 2012, when officials discovered an 82 gallon per day fluid leakage in the Unit 3 replacement generator. Unit 2 was undergoing a refueling outage at the time of the shutdown. The third reactor, Unit 1, has been decommissioned since 1992. Upon shutdown, San Onofre officials discovered higher than expected tube wear in the replacement generators of both reactors. The Mitsubishi Heavy Industries report determined that tube wear from contact with other tubes, anti-vibration bars and retainer bars in the Unit 3 replacement steam generator caused the leakage. The report also says that San Onofre officials considered design changes to the replacement generators before their installation, but rejected the proposed fixes in part because they required additional regulatory approval. Mitsubishi Heavy Industries received the contract to replace Southern California Edison’s original steam generator in 2003. The Japanese engineering firm installed the Unit 2 replacement generator between September 2009 and April 2010 and the Unit 3 replacement generator between October 2010 and February 2011. 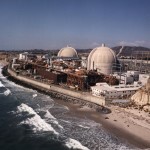 Due to the indefinite shutdown of San Onofre, Diablo Canyon is now the only operating nuclear power plant in California and on the entire Pacific Coast. The Electric Power grid is shared between various power companies and generation sources. I understand that affordable electricty elsewhere is because those who live in a low demand area pay higher rates to susidize those areas that require a greater demand to live. That having been said, my guess would be that we all pay for San Onofre, whether or not they are our franchise company. If that were not true, their rate payers would have been paying astronomical rates to cover this cost. This Nuclear Plant seems to be a fiscal sink hole and more so when decommissioned. There should never be an errror in this business but it sure seems like it can happen. Very scarry! How many jobs have been lost? How many lives have been saved? Yes, SLO Man, it’s a shame that a public utility has so abandoned the public trust that it put the electricity supply as well as hundreds of jobs at SONGS at risk, just to try to keep the company more profitable. Wait—that’s exactly what the corporate charter states the company is supposed to do! Ratepayers, nuclear engineers, other workers . . . well, they can take the hit.